Please check that the device you are using such as a Laptop, Tablet, Computer, Smartphone, etc. supports the Wi Fi network function. 1.To set up your wireless network access, please go to “Network Settings” and complete your wireless network setup as illustrated below. 2.Click the Wi-Fi connection function. Open your web browser, you will be automatically directed to the iTaiwan website. 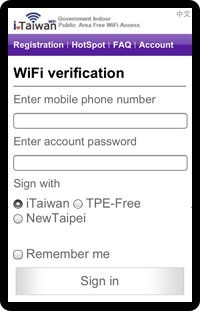 Enter your iTaiwan account and password to login. 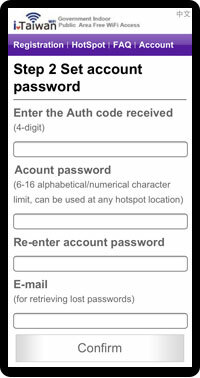 1.Enter your mobile phone number and password. Enter your mobile phone number, graphic code, and then press the “Request for Authorization Code via SMS” button. A 4-digit authorization code will be sent to your mobile phone. 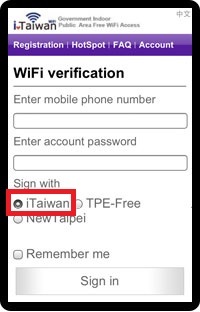 1.If this is the first time accessing the iTaiwan network, you will need to go through a verification process via your mobile phone to register for an account. 2.Click the “Register” button located at the bottom of screen. 3.Enter your mobile phone number, graphic code, and then press the “Request for Authorization Code via SMS” button. A 4-digit authorization code will be sent to your mobile phone. 4.Enter the authorization code received, your password, and e-mail address. 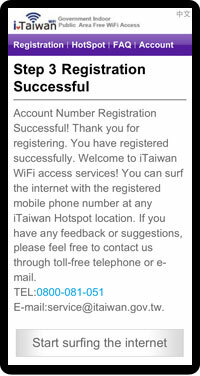 5.Congratulations, your registration is successfully. 1.Open your web browser and you will immediately be directed to the log-in page. Enter your mobile phone number and password. 3.After verification, you can see some message that how to logout if you log in successfully. 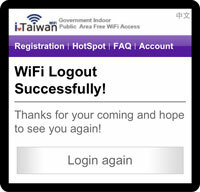 4.If you want to logout from iTaiwan, you can visit http://88.gov/ and you will be logged out.